An overflow relief gully is truly a little beauty. He doesn't ask much, he's misunderstood, sometimes people run rainwater into him, sometimes idiots rip him up or cover him over. Yet he doesn't complain, he's almost maintenance free but he is always there there to protect us when things start to go wrong. He is of course, our old mate the ORG. ORGs are a critical part of your sewerage system, and as such should not be altered by the homeowner without checking with a licensed plumber, or the authorities. 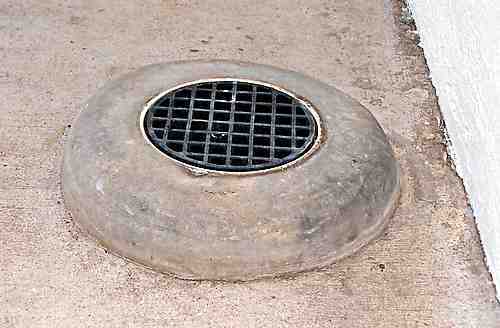 Relief gullies are usually at the end of the house sewer system, close to the house. From the gully the sewer line heads straight for the sewer main connection. On a large house with a few bathrooms there can be more than one ORG. The relief gully is always set lower than the floors in your house that have floor wastes, bathroom,toilet, laundry etc. The reason for this is that if for any reason, the sewerage system gets a blockage, it will overflow from the relief gully outside your house, NOT IN YOUR BATHROOM. So, if you or a former owner of your property has covered over an ORG, with concrete, garden beds or plant pots, you would be silly not to fix it. There are many and varied reasons why the sewerage could back up into your property. A blockage inside your property before the mains connection. Quite common with us here in the tropics, is damage by tree roots. The old terracotta sewerage pipes can crack over time and tree roots will invade then looking for moisture. Sooner or later you may get something larger going down that finally blocks the whole line. Result overflowing at your relief gully. A temporary fix is to get a plumber in with a drain machine, and he'll cut out the blockage. This could last a couple of years before it happens again, but sooner or later there will be a permanent repair needed. There is damage to the main sewer line downstream of your property. This is not your responsibility as a home owner, but the fact is if you don't have correctly functioning ORGs the inside of your house will still get flooded. We had a case a few years ago where in a low lying suburb, under certain conditions a whole street of houses was flooded by sewerage that was traveling down to them from the area upstream. The system downstream of them could not cope. A few more points on the relief gully. The fact that the one in the photo sits higher than the surrounding concrete is not an accident. It is to stop rainwater and storm water from entering the sewerage system. Like most services these days the sewerage departments are battling to keep ahead of demand, so the last thing they want is mega liters of extra water in their systems to process. There is a demand from builders and home owners to allow the relief gullies t be sat flush with concrete footpaths etc. In some places this is allowed, so it is as always a case of checking your own regulations. Therefore it is against bylaws etc to allow rainwater or whatever into the sewerage system. The plastic grill that sits in the concrete must be loose, so that if it gets clogged with paper or whatever, the pressure will lift it off and the gully will still overflow. So if you have an older type, that is fixed or stuck, it is a good idea to upgrade it. Leave relief gully and back to home page.